For the transportation of steel plate, Anic Associates have developed the "Wide Plate Vehicle" (Operational code: RKYY). This vehicle was specially designed to enable the transport of wide steel plate, with a width of up to 3400mm. The vehicle transports steel plate from Port Kembla Steelworks to national distribution centres across Australia. Maximum load width is dictated by the rollingstock outline and limited to 3050mm. 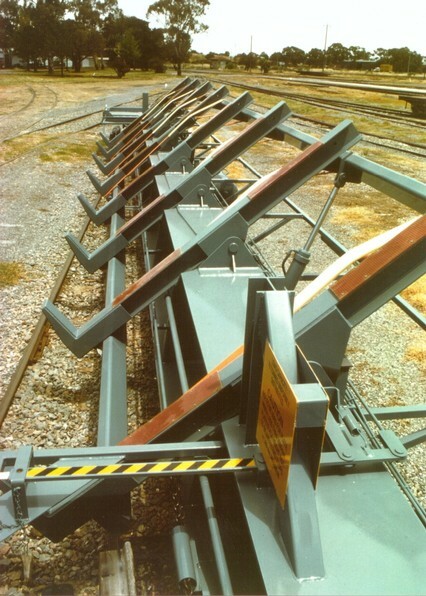 Loads that are in excess of this width are classified as "out-of-gauge" loads and need to run at reduced speed, hindering operational efficiency. The vehicle was designed with a special hydraulic tilting system that rotates the wide 3400mm steel plate "in gauge". Once "in-gauge" the vehicle can run without any operational restrictions (up to maximum design speed of 110 km/hr). The number produced to date and in operation are 27. These have been in operational service since 1995. For more information or to obtain a detailed specification on the Wide Plate Vehicle, please contact Anic Associates.